Mercedes drivers Lewis Hamilton and Nico Rosberg could complete a clean sweep of all 19 races this season, says Ferrari's Fernando Alonso. Mercedes have taken pole position and victory at every race so far in 2014. "They should be in a position to win all the races probably, so it is going to be tight between them," Alonso said. Hamilton, on pole for Sunday's Spanish Grand Prix, said: "I have not thought that far down the line. I am trying to focus on what's happening now." He added: "If the team continues to develop as it has, there's every chance we could do that. Our goal is to win everything." No team has ever won all the grands prix in a single season. The closest any has come was McLaren in 1988, when Ayrton Senna and Alain Prost won 15 of the 16 races. They only failed to win them all because Senna crashed while lapping a backmarker at the Italian Grand Prix. This season, Hamilton has won three races and four poles to Rosberg's one ahead of Sunday's race at the Circuit De Catalunya. The two Mercedes drivers will start on the front row in Spain, and Hamilton's qualifying lap was a second clear of Daniel Ricciardo's Red Bull in third place. Alonso, who starts seventh but is third in the championship, said he felt the title could be decided on reliability, pointing to Hamilton's retirement from the first race of the season that has left him four points adrift of Rosberg. "Probably the championship will be decided by who finishes most races between them," Alonso said. "I think the mechanical side and luck will be a factor because we saw Lewis is doing some extra from Nico in these first four races, but he is second in the championship because he didn't finish one race. "That will be the key of the championship for them." Rosberg was pleased Mercedes had maintained their advantage despite all of the teams bringing major upgrades to Spain, but pointed out they could be challenged for victory as soon as the next race in Monaco. "I'm very proud the team managed to hold onto the advantage we had. 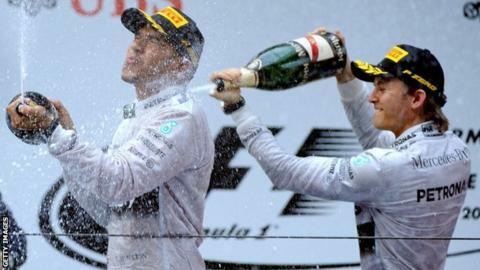 Our ambition is to extend it," Rosberg said. "We managed to keep it similar, which is fantastic to see because Barcelona is such a milestone in the season. Historically, if you're quick here you're going to keep an advantage for the next couple of races. "Saying that, Monaco is coming up, where one of our big advantages, which is power-train performance, is going to be mitigated in a way, so people are going to be a lot closer. Especially Red Bull, I would expect to be a big challenger in Monaco." Alonso acknowledged Ferrari were a long way off Mercedes' pace - he and team-mate Kimi Raikkonen, who pipped the Spaniard to sixth place, were 1.8secs slower than Hamilton - but insisted he was still confident they could catch up. Alonso said: "I'm confident, or I hope, this 1.8 seconds will not be that much any more, that we will close that gap, starting from Monte Carlo where there are not many straights. "We know it's tough but we think we can do it. What we need to do is just work and deliver the results. "We brought new parts here and we are sixth and seventh, so it is difficult to make magic, but we are fully committed, engineers work day and night and we are very united on that goal."